The Endowment Fund of Altai State University together with the Altai-Falcon Rare Birds Laboratory at the South Siberian Botanical Garden of ASU are currently making preparation for a major event, which will be a part of the charity program of the Vladimir Potanin Charity Foundation. The project has become a winner of the Endowment Growth Strategy competition and lies in releasing the Red Book falcons, that were born in the laboratory in the spring of this year, into the wild. Ten rare birds have already been prepared by the specialists of the Altai-Falcon nursery for life in the wild and, accordingly, trained in hunting skills. 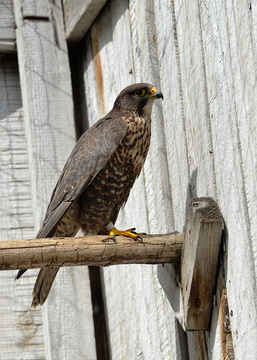 Among the falcons released there will be several individuals of the Falco (cherrug) altaicus, which is a falcon of a rare dark morph that has practically disappeared from the face of the earth. “Since 1996, we have released more than 400 birds into the wild. But due to poaching activity, illegal hawking of falcons, reduction of food resources, changes in habitat in the recent years there has been a sharp reduction in the nesting area of the Saker Falcon and, accordingly, its number. For example, its number has declined by about five times in Altai Krai. Pasture livestock farming has always contributed to the creation of favorable conditions for the Saker Falcon, for its hunting, since it is easier for the birds to find prey in low herbage. But cattle grazing has decreased, and the number of gophers has decreased – this, combined with other reasons, has contributed to a sharp decline in the number of birds in the wild,” Viktor N. Plotnikov, the head of the laboratory, explained. It is planned that the event will be attended by representatives of controlling environmental units, the Ministry of Natural Resources and Ecology of Altai Krai, representatives of public environmental organizations, volunteers and students.